Dental School: University of Pennsylvania 1991/ D.M.D. Dr. Sadri was born in Tabriz, the Northern Province capital of Azarbaijan. In 1985, Dr. Sadri and her husband moved to Pennsylvania in order for him to achieve her doctorate in engineering. In 1986, Dr. Sadri gave birth to their daughter, Elika, who works for a tech company and plays the violin. From 1991 until 1999 she practiced general dentistry in the Philadelphia area where she received her certification in Implantology and was a faculty member at the University Of Pennsylvania School Of Medicine from 1994 until 1999. During her employment at the university, she received the Certificate of Appreciation for Excellence in Teaching for her extraordinary accomplishments as an instructor. 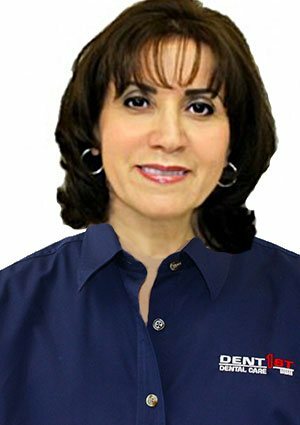 In 1999, she and her family relocated to Johns Creek, GA and she joined the DentFirst team in July 2000. She enjoys all aspects of dentistry, and her other interests include traveling, reading books, hiking, and listening to Persian and Western music. She has traveled to most European countries. She is fluent in English, Turkish (Azari), and Farsi. Patients can visit her at the DentFirst Buford office.